High Schoolers, have you ever wanted to have the opportunity to solve a real life business problem? Then CO.STARTERS 24 Hour GENERATOR is for you! During the 24 Hour GENERATOR, you will meet real entrepreneurs with real problems who will pitch their problems to you! Then you will have the opportunity to combine your talents with others in the group to solve the problems and present during a final pitch. You’ll generate real solutions to real problems and become a business hero! 24 Hour GENERATOR starts on a Friday night 7-9 and then continues all day Saturday 9am-9pm. That’s a whole lot of pizza to eat. At the end of the pitch on the Saturday, judges will award one high school student a $5000 Scholarship to Alphacrucis College that can be used towards any university degree. Other special gifts and giveaways! 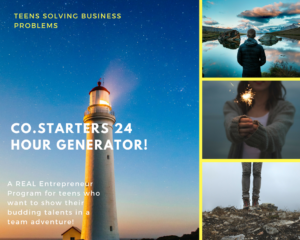 24 Hour GENERATOR gives you the opportunity to further develop business skills you’ve learned at home, at school, and/or through doing the 7 week CO.STARTERS GENERATOR program. $264 (GST Inclusive) which includes all resources and food on Friday evening and all day Saturday. Note: We need to accept your application before you can pay. Numbers are strictly limited for the 24 Hour GENERATOR and applications close on 31st January. Applications are open to any high school aged student at school or home schooled. 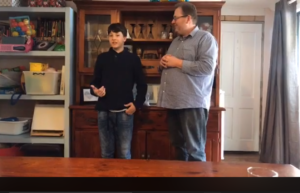 Entrepreneur Alec (12) talks about his business and how he go started. Alec (12) and his brother (15) are booked in for our full 7 week GENERATOR program group (see other current event for home-schoolers). Alec is quite an entrepreneur already and the brothers are part funding their places using the profits from the sale of their eco washing power. Watch as Alec explains how he got into entrepreneurship on our facebook page at https://www.facebook.com/hereinAus/.